Preheat oven to 140C/120C fan/Gas Mark 1, line two baking trays with parchment paper. Put the egg whites into a large bowl. Add a pinch of salt before whisking with an electric beater until the eggs have formed soft peaks. Begin to add the caster sugar to the egg whites, one tablespoon at a time, whisking on a high speed between each tablespoon. Once the sugar has been added, whisk the mixture on a high speed for a further 3 minutes or until it is glossy and forms stiff peaks. Gently fold in the vanilla extract with a large metal spoon. Use a tablespoon to scoop meringues onto the prepared baking trays. For the ripple colour effect, dip a cocktail stick into the red food colouring and swirl it through your meringues. Now bake in the oven for 30 minutes. Turn off the oven and leave the meringues in the oven to cool completely with the oven door slightly open. 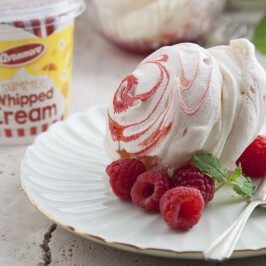 To serve sandwich two meringues together with Avonmore summer Whipped Cream and serve with raspberries and mint on the side.